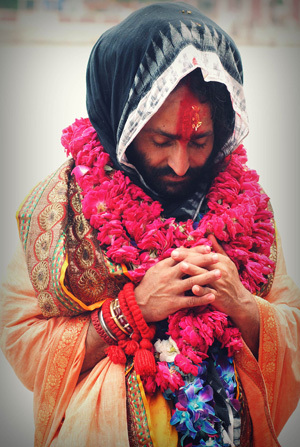 Sri Balak Yogeshwar Maharaj was born on July 30th 1967 around midnight as the youngest son of five children nearby a town called “Pouni” in the state of Jammu & Kashmir which is situated in the North-Western part of India towards the border of Pakistan. He grew up in a tiny remote village named “Sadhini”, his parents earning their livelihood by agricultural means. During his childhood, he was lovingly called “Yoga”, and he used to attentively listen to the stories from the Bhagavat Purana [ancient Vedic scripture also known as “Srimad Bhagavatam”] such as the stories of Dhruva Maharaj and Prahlad Maharaj told by his mother. Maharaj’s family followed one powerful saint called “Dhudahari Baba” who used to perform havanas [Vedic fire sacrifices] in remote mountain areas in which the local farmers would participate. 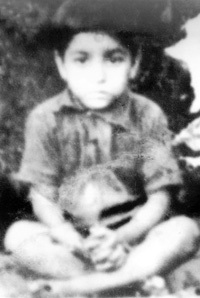 In this way, Maharaj already got some saintly association at a tender age. This sadhu-sanga [association with a saint] left a tremendous impact on his consciousness, so much so that when Dhudahari Baba passed away in 1984, Balak Yogeshwar Maharaj decided to leave home and take to the lifestyle of a traveling mendicant. There was no objection from his family’s side when he retired from home since they understood his burning desire to discover God. First of all, he travelled to Haridwar where he was staying at the ashram [saintly community] of Dhudahari Baba who had just left this world. There, he was taking care of the goshala [service to cows] for one year continuously. After that, he decided to leave for Badrinath, and that’s where his actual tapasya [renunciation or hard penance] started. 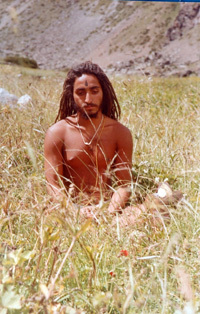 For approximately four to five years, Maharaj didn’t meet anyone and followed a strict mauna-vratta [a vow of silence]. No-one clearly knows what kind of practices Maharaj used to follow during those years, but it was observed that he spent a lot of time on the banks of the Alakananda river. Maharaj recalls that he was intensely searching for God, but that his path somehow was not yet clearly chalked out at that time. The main turn in Balak Yogeshwar Maharaj’s life happened when he met his diksa-guru [initiating spiritual master] Sri Paramanand Avadhutji Maharaj in the Himalayas. Balak Yogeshwar Maharaj spent the following five years in the ashram [saintly community] of his guru [spiritual teacher] and very dedicatedly served him although Avadhutji Maharaj was not eager to accept anyone’s menial service and besides that, he was not at all talk-active. However, pleased by the service rendered by his disciple, Avadhutji Maharaj initiated Balak Yogeshwar Maharaj into various powerful mantras [prayers, hymns] and taught him the art of kriya-yoga [a meditational practise]. One day, Balak Yogeshwar Maharaj heard some sadhus [saintly mendicants] talking about a remote place in the Himalayas called “Satopanth” which is covered by glaciers and snow and quite hard to reach. Having gotten curious, he approached his guru and asked him for permission to visit that hidden place. After obtaining the permission of his spiritual master, he searched out for that place and stayed at Satopanth for about four days. Thereafter, he returned back to the ashram of his guru. After some days, his guru asked him whether he had visited Satopanth. Being pleased with his disciples’ effort, Avadhutji Maharaj blessed his shishya [disciple] with an extremely rare and powerful mantra upon receiving which Maharaj immediately headed towards Haridwar and took bath at the Hari-ki pauri ghat [sacred bathing spot at the river Ganges in Haridwar]. As an act of severe penance and humility, Maharaj then started a dandavat-parikrama [crawling-like pilgrimage] back towards Satopanth which he had previously visited. When he reached Satopanth, he started meditating in the mental presence of his spiritual teacher who had bestowed these powerful mantras upon him. By the grace of God, Maharaj was then able to dive into a deep meditational trance in which he received various divine instructions. One of the significant revelations he had during the weeks he stayed at Satopanth was that he should travel all over the country and perform havana [Vedic fire sacrifices] and get the people to chant God’s sacred names. After this incident, Maharaj regularly visited Satopanth and would stay there for approximately two weeks at one stretch. He had also been seen spending time at Swarga Rohini (which lies even beyond Satopanth), as well as in a cave at Nilkanth which is situated behind the big temple in Badrinath near a crossing which is known as “Kaak Chowk”. At Kaak Chowk, an ancient Hanuman-Mandir has been situated since time immemorial of which Balak Yogeshwar Maharaj became the mahant [spiritual care taker] by the desire of the pandits [the learned priest class of society] and the local people of Badrinath in 1990. Furthermore, he has been counted as the youngest Mahamandaleshwar [order of renunciates founded by Srila Shankaracarya around 800 A.D.] of the entire country, i.e. India. 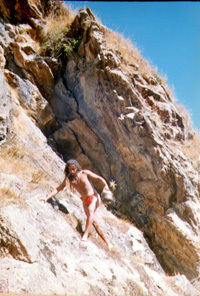 Around this time in 1990, an elderly person in the holy place “Radhakund” (Dist. Mathura, Uttar Pradesh) had a dream that he should deliver some Radha-Krishna murtis [sacred statues] to a very young sadhu (i.e. 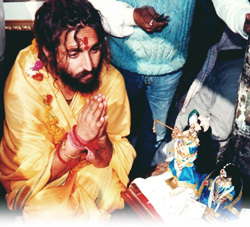 Balak Yogeshwar Maharaj) in Badrinath. Stirred up by this dream, that elderly man made out the whereabouts of the murtis to be delivered and upon excavating them, he started his journey towards Badrinath where he was searching for that young saint whom he initially could not find. The elderly man then again had a dream in which he was able to recognize Maharaj’s face, and by some divine arrangement they both met at the Badrinath temple the very next day. That’s the moment Balak Yogeshwar Maharaj received his beloved Radha-Krishna Deities of which he is very fond. Since his Deities came from that holy place Radhakund, Maharaj started visiting Radhakund occasionally in the year 1993, and he used to stay at that old man’s house who had delivered the Radha-Krishna statues to him. 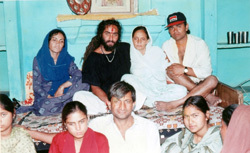 It was a bit before this period, around 1991, that Maharaj started accepting his first couple of disciples. His first student was named “Mr. 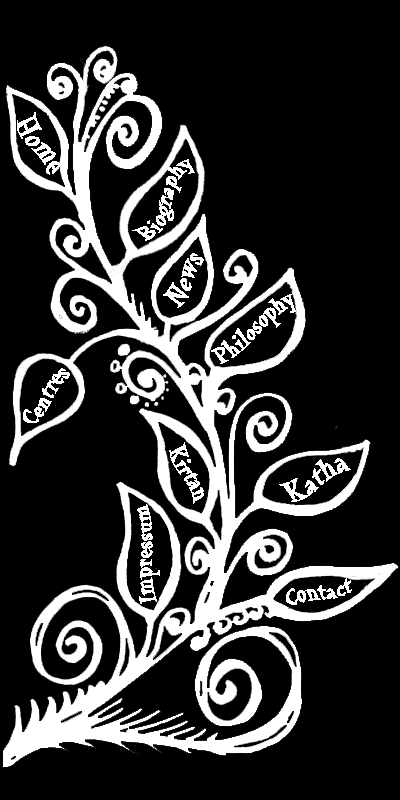 Prashant” who was a resident of Badrinath. 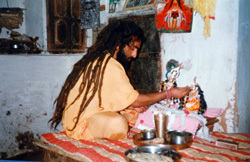 When Maharaj stayed in a cave near the main temple of Badrinath, Mr. Prashant used to serve Maharaj some milk and repeatedly requested initiation from him. Balak Yogeshwar Maharaj’s initiating spiritual master, Avadhutji Maharaj, had previously instructed Maharaj to accept disciples in order to show the common people the proper path of spiritual life. Following the order of his master, Balak Yogeshwar Maharaj gradually started accepting disciples. 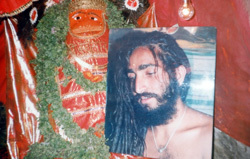 An important key role in Maharaj’s life played his cousin brother Davinder Singh (also known as “Pintu”) who came to visit Maharaj in Badrinath in 1995, having lost touch with him since childhood at the time Maharaj left home in 1984. Impressed by Maharaj’s present way of life and tremendous spiritual power, Pintu – although being Maharaj’s cousin brother – decided to take shelter of Balak Yogeshwar Maharaj’s and accept him as his spiritual guide. Pintu was dissatisfied with the kind of so-called sadhus which used to wander around his native place Jammu at that time, and that’s why he urged Maharaj to return to Jammu and take up preaching there for the benefit of the general people. 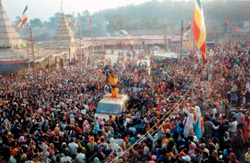 Initially, Maharaj was rather hesitant to return to Jammu, but in due course of time, more and more people from Jammu came to visit Maharaj in Badrinath and pleaded him to come back. Another significant incident deeply impacted Maharaj’s life, namely the passing away of his gurudeva Sri Paramanand Avadhutji Maharaj in 1996. Avadhutji Maharaj passed away in Rishikesh during his meditational practice, sitting in padma-asana [crossed-legged sitting posture]. For quite some time, no-one realized that he had passed away since everyone was thinking that he had entered some meditational trance [also known as “samadhi”]. For about one year, Balak Yogeshwar Maharaj was emotionally deeply stirred up and felt bereft of his beloved teacher. 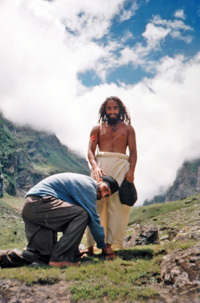 As previously mentioned, the visitors from Jammu gradually increased in Maharaj’s hermitage in Badrinath and it so happened that some of them started assembling at their homes in Jammu and occasionally hold sat-sanga programs [spiritual home programs], being inspired by Maharaj’s association and instructions. 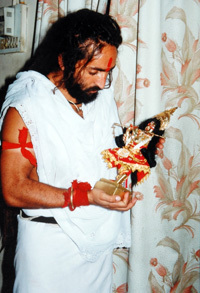 In 2000, Maharaj sent his beloved Radha-Krishna Deities to Jammu where They stay up to this day and where They bless the sat-sanga programs of the local followers of Maharaj with Their divine presence. Finally in 2003, Maharaj reluctantly returned to Jammu where he performed a huge yajna [Vedic fire sacrifice] in the dried-up riverbed of Jammu [also known as “Jammu Tawi”] which was attended by not less than 10 lakhs people [approx. 1,000,000 people]. This event drew a lot of attention from different walks of society in Jammu and even created headlines in the media. In 2006, Balak Yogeshwar Maharaj started performing fire sacrifices in Kargil, i.e. Drass – a place where the war between India and Pakistan was fought, and which happens to be a very ancient historical place. Since a lot of Indian martyrs lost their lives during the Kargil war, Maharaj took it as an opportunity to pay respect to the departed souls and to make an extended statement by proclaiming world peace in general. Maharaj in this way also got a new name - Sainik Baba, which means as much as “The father of the soldiers”. Up to this day, Maharaj is traveling all over India and is performing havana [sacred fire ceremonies] in various places. At this time, he has about 50,000 initiated disciples which constitute the core of the huge followership he has. He has never travelled abroad (apart from Nepal), although once in 2005 he was supposed to travel to the USA. Standing in the queue at the airport to check in his luggage, he all of a sudden felt separation from his Radha-Krishna Deities so much so that he decided not to fly off, but to return to Jammu in order to celebrate Janmastami [Lord Krishna’s appearance day] there. In conclusion, it can be said that Sri Balak Yogeswhar Maharaj is a very extraordinary and blessed saint who is inspiring thousands of people on their spiritual sojourn. He’s a shining example of dedication to the Lord and whoever has met Maharaj will not be able to ever forget his gentle nature and his kindness.